If your furnace isn’t functioning properly — and you’ve ruled out the usual suspects: dirty furnace filters, broken hoses, etc. — your thermostat could be to blame. Sometimes, faulty or aging wiring, dust accumulation, extreme temperature changes, and other issues can cause your thermostat to malfunction, rendering it unable to properly communicate with your heating equipment and regulate the temperature of your home. Typically, thermostat issues will cause your furnace to stop producing heat, to put out erratic amounts of heat, or to cycle on and off more frequently than is necessary. If the display on your wireless thermostat is not indicating power, try simply replacing its batteries. If the system is running at inconsistent times, ensure that you are using AA Lithium batteries. Alkaline batteries will run out of juice quickly and may cause inconsistencies and failures in your system. If it’s not the battery, check the power switch; it’s easy to mistake this for a light switch and turn it off. If it’s not the battery, it could be a fuse or circuit breaker. Ensuring the proper operation of your furnace requires correctly matching your thermostat to your heating system. Low voltage thermostats are typically used in residential applications. Your thermostat must be matched to your heating system based on the type, capability, and capacity of your furnace. Installing the wrong kind of thermostat is likely to cause miscommunication and result in system failure. To ensure proper matching, consult with an HVAC professional or take your old thermostat with you when you’re shopping for new or updated equipment. Loose connections, disconnections, and faulty and aging wiring can cause your thermostat to lose its connection to your heating and cooling systems, thereby causing an interruption in service. If your furnace stops working properly, it’s a good idea to inspect your thermostat’s wiring. If you suspect faulty wiring, tighten and replace wires as necessary, or consult with a knowledgeable HVAC professional. A dirty thermostat can cause erratic operation and sudden system failure. To address this issue, remove the cover from your thermostat, and gently clean its interior components — including the bimetallic coil and switch contact surfaces. First, set the thermostat to its lowest setting and use a soft brush or compressed air can to clean the bimetallic coil. Then, set the thermostat to its highest setting, and clean the coil again. Finally, reset the thermostat to your preferred setting. You will find an electrical resistor device — a small metal tab — mounted in the center of most mechanical, non-digital thermostats. This device, called a heat anticipator, tells the thermostat when to turn off the furnace burners. And when it is not functioning properly, it may cause your furnace to cycle on and off more frequently than is necessary. If your heat anticipator is improperly set, it will require an adjustment. Digital and programmable thermostats have built-in anticipators that set themselves automatically, requiring no manual adjustments. Mechanical thermostats, however, must be manually adjusted — ideally, using an amp meter to determine the proper setting. Sometimes, giving the heat anticipator a light push in both directions will be enough to solve the problem. If your furnace fails to kick on when it should, or if it turns on when it shouldn’t, an inaccurate temperature reading may be the culprit. Check to ensure that your thermostat is installed in the proper location — away from outside doors and windows and heat sources such as fireplaces and radiant heaters. Exposure to direct sunlight, heat emissions and outside temperatures will give your thermostat an inaccurate reading, thereby triggering your furnace to turn on and off when it shouldn’t. Experts recommend that thermostats be located close to the return (where the filter is installed) to allow for the most accurate temperature reading possible. Drafts coming from the area behind your thermostat may also cause inaccurate temperature readings. 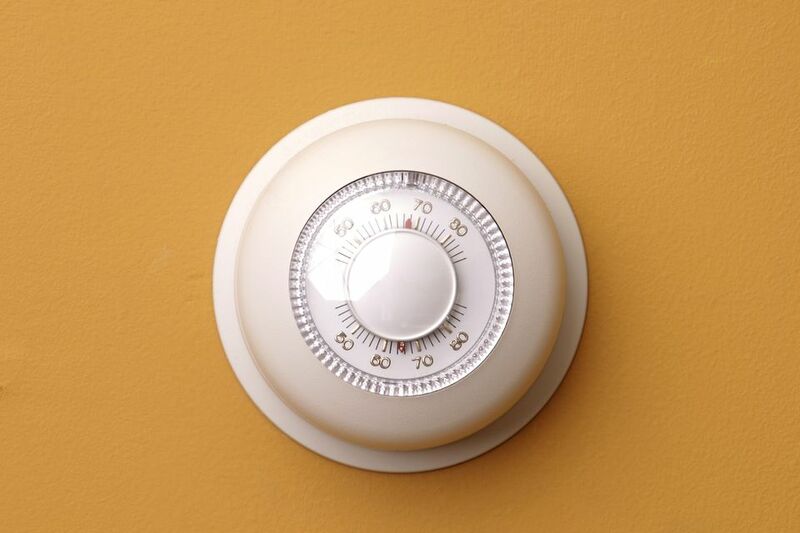 Should you find a significant void behind your thermostat, try filling it with some insulation to curb the airflow.